Sam Raimi returns to Oz in this multicolored fantasy that retains many of the original film’s recognizable elements, if not its overall feeling. I’m finding it hard to decide if Oz is up to a similar trick of early-film mythmaking as Martin Scorsese’s Hugo, or if it’s simply an overblown Hollywood family film with a story like any other. Either way, it’s a fine if ultimately forgettable adventure to a place in film legend. Oz stars James Franco as the goodhearted conman whom we find pulling the strings at end of 1939’s The Wizard of Oz. He wasn’t always so sure of his goodness, however, and Raimi’s film charts his comfortably predictable journey from an egotistical, lying circus magician to the poster boy for the mantra that Disney and Hollywood has sold since the original film: “believe in belief.” Behind the munchkins, wonder and rose-colored glasses of The Wizard of Oz, we should remember, lies a strangely cynical heart in the Wizard himself. You don’t need to go to school, just take this diploma. Who needs courage, this medal will do just as well. It’s a happy scene, of course, but the Wizard tells us that things, symbols, and a dash of belief are just as good as the real things. Raimi wisely makes trickery the center of his story and ultimately arrives at the same conclusion: belief is all you need. Franco’s Wizard must destroy the wicked witch in order to free the people Oz and ascend to the throne. (I was never quite sure what they needed to be “freed” of; they seemed perfectly happy to me.) At first he’s only interested in the riches that come along with the title, and worries people will soon wise up to his act. He’s not the real Wizard, just a conjurer of cheap tricks. Over the course of the film, (a bit too late for my tastes) he realizes that in fact his brand of magic and wonder is actually just what the land of Oz needs. Franco, as anyone who saw him host the Oscars knows, is a strange performer. Still, I can’t help but find him compelling. He has just the right combination of sleaze, charm and boyish earnestness in this role. That latter quality becomes very important, helping us remain interested when Franco appears alone in a sea of digital creation. 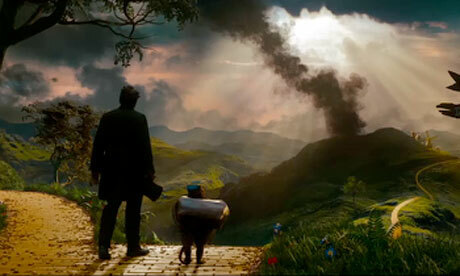 There’s a lot of brightness in Raimi’s Oz, but little substance. We should, however, be careful not to dismiss CGI worlds too quickly. For one thing, they allow for almost unlimited camera mobility (like, for example, The Adventures of Tintin.) Indeed, Raimi’s “camera,” if one was even used for much of the film, swoops and careens to animate the world. Still, there’s no feeling of gravity, for the cameras or the character. Everything feels like it could simply lift up and float away. This effect, I think, works for the magical world of Oz, but filmmakers should be careful that this strange thinness of digital imagery is appropriate. It works better in fantasy than in action films, for example. Still, I don’t think any children will be scarred for a lifetime from Raimi’s creepy digital monkeys like they were for the original film. Everything is too ethereal. Oz: The Great and Powerful wholeheartedly buys into Disney’s ideal of blind, optimistic belief, even though it knows a faker is behind the curtain the whole time. Somehow, I kind of admire that dedication.